"Truly amazing app!! Saved me so much money on ammo... Had me shooting a 2 inch target at 200 yards! Easy to use as well. Makes sighting in fun rather than a pain in the a**..."
"Shot a box of 30/30 trying to zero in .... No luck. Used the app in 2 shots zeroed. Does what it says"
And it can get even more frustrating when you get it wrong - especially if you're a novice. Anything from incorrectly estimating the average shot fall from the target center, dividing a value to correct for a range instead of multiplying, right down to simply turning an adjustment dial in the wrong direction. (Yes. We've all done it.) ...And things can get really complicated when you also have to account for distances, target measurements & scope adjustments that are mixtures of inches, feet, yards, centimeters, meters and MOA! All of which can waste a ton of time, not to mention ammunition that either cost you a fortune or took a lot of care and effort to prepare. In a nutshell, that was precisely why we created SightSet: to make sighting-in quick, take away the errors, save you money and give you more time to do what you enjoy - shoot! It works like this: you plug all of the details of the scope or sight, targets and shooting distances that you are using into SightSet. Then, as you take each shot, you just plot it on screen on a zoomable image of the same target. SightSet uses your observed shooting data to calculate the adjustments that you need to make to your sight. If you're sighting in using groups of shots, it calculates average distance from center. SightSet then tells you the number of click adjustments to make and even reminds you which direction to turn the dials in. No estimations to make. No calculations to perform. SightSet is designed to help all types of shooters to zero their sights quickly and easily, with support for US/imperial, metric & MOA measurements & settings. So it's ideal for small bore, full bore, air rifle or precision air-pistol shooters (even pistol shooters with adjustable sights). And it works just as well with diopter as with telescopic sights. Follow the simple steps through the Howto section and see just how easy SightSet is to use. Or, if you want to see what's new in the latest version, why not check out the FAQ section? There are also a host of tutorial videos that cover everything about SightSet. SightSet is just the first in our series of Shootility apps. We'll be adding more, so please check back. 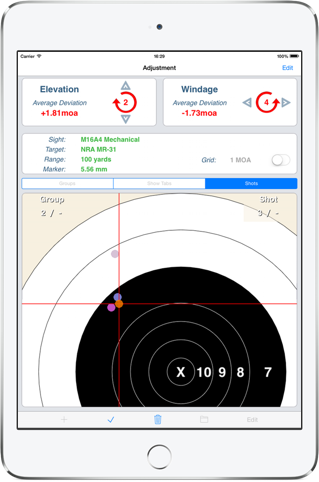 If you have an iPod touch, iPad or iPhone, you can find Shootility SightSet in iTunes, by clicking on: http://AppStore.com/ShootilitySightSet, or just click the App Store button below. Apple, iTunes, iPhone, iPad & iOS are trademarks of Apple Inc. Amazon, Kindle & Kindle Fire are trademarks of Amazon Inc. Android & Google Play are trademarks of Google Inc.